Principal Christa Thomas says she wanted students to see themselves reflected in a mural painted on the hallways. The painting also reflects the school's custom of calling students "kings" and "queens." 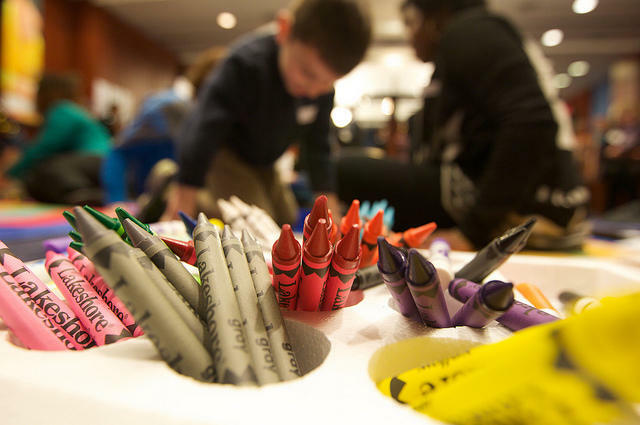 Many schools aspire for racial diversity. But that’s not quite the aim of the newest charter school in North Nashville. 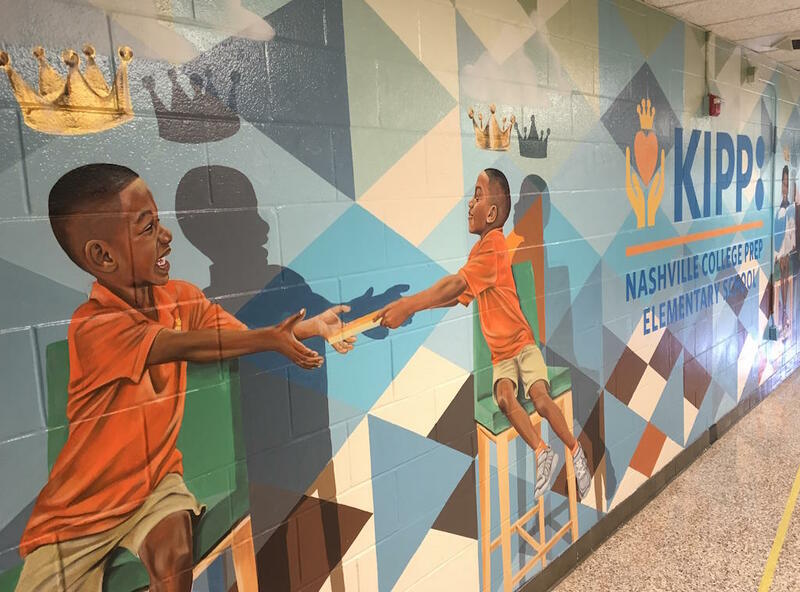 KIPP Nashville College Prep Elementary says it is embracing what is a reality for most schools in the area: that students are primarily African-American, and instead of swimming against the current, it’s trying to turn cultural isolation into a positive. The empowerment theme is intentional. "We are also seeking to affirm them in their racial and cultural identities and let them know that they can be unapologetically themselves, and they have the power within them," says founding principal Christa Thomas. "They were born with that power, which is why we refer to them as kings and queens and the royalty that is already inside of them." Thomas spent a year in KIPP's fellowship program designing this school and recruiting teachers. She wanted kids to get an experience she didn’t have before attending Spelman College in Atlanta. Until then, Thomas says she never felt like she could be herself in school. "I chose after high school to go to a historically black college, because I felt there I could be affirmed, I could be seen, I could be loved, for who I was," she said. Thomas’s school is partially a rebuke of what has been dubbed a “white savior complex” — white teachers spending a couple of years teaching in a mostly black, low-income school, then moving on. Thomas says she doesn’t want her students to think there’s something wrong with them that needs fixing, even though many come from what are considered disadvantaged backgrounds. And she wants to have someone who looks like them at the front of every the classroom. "They see, like, 'I, too, can be a teacher because I see a black male teacher,' " she says. " 'I can be a principal. I see my black female principal walking through the hallways.' "
Jeremy Williams leads a lesson on "Tales from Africa." 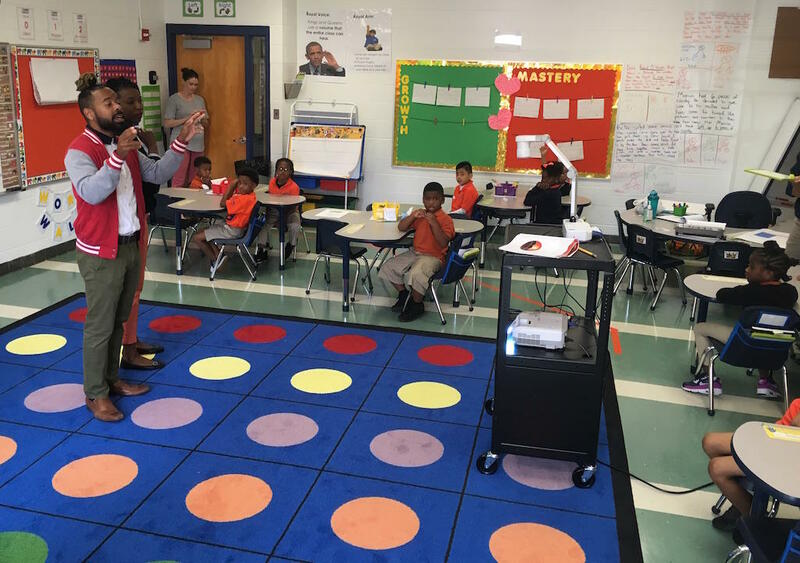 Jeremy Williams is one of the teachers Thomas recruited, and he’s part of a highly sought after demographic in the education world — a black, male, elementary school teacher. "When she told me the neighborhood we would be in, and she told me her vision for having like an African-American school with African-American teachers, I was like, 'Oh, I'm in.' That's all I needed to know," he said. The school — which shares a building with another KIPP school on Knight Drive — is around the corner from where he grew up, and he already shared its mission. "Society will not tell African-Americans how powerful they are," he said. "But KIPP Nashville College Prep Elementary is going to be that school to do so." Beyond referring to students as royalty, the curriculum places an emphasis on black heritage. On a recent morning, Williams was going over Tales from Africa with his first grade class. "By a show of royal arms, who can tell me the setting of our story?" he asked. Students raise their hands. "Africa," one answered correctly. KIPP's new elementary school in Nashville is experimental, but to be clear, it is not exclusive. Race is not a prerequisite for enrollment, just like it's not at the nation's HBCUs. Still, catering to African-Americans runs counter to efforts across Nashville to breakup what the school district calls "minority group isolation." Even decades after desegregation, many public schools in the city remain largely single race, which the district sees as a problem. But historian Learotha Williams of Tennessee State University — who consulted with KIPP on the concept — says learning with black students and teachers could be a valuable experience. "I don't have problems with black folks creating spaces to deal with issues that are peculiar to them, places where they can get together and discuss strategies to deal with their existence," Williams says. Nationwide, more than 80 percent of teachers are white, according to U.S. Education Department statistics, and even the curricula can be biased toward white culture. One parent, Latoya Morgan, noticed that growing up in Chicago. "We learned about stuff in Europe, and we're not from Europe," she said. "There's a lot of things they don't teach us in schools that not only black kids but all kids should know." Morgan says she’s not too worried about isolating her daughter, who is in kindergarten at KIPP’s new elementary. As a parent, she says, it’s her job to make sure her child has a diverse experience outside of school. Rather than just asking kids what they want to be when they grow up, Nashville’s public schools are experimenting with a new test developed by a local company to help students figure out what they’re naturally good at. Metro Schools have already made a big push to get students thinking about careers early on — this is the next step in also helping them find the right fit. 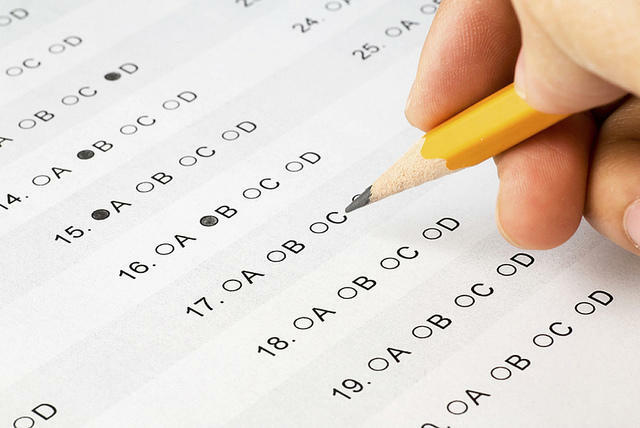 Tennessee lawmakers were surprised to hear that widespread grading errors in the new standardized test might have gone undetected if not for a school's concern about a high performing student. This week legislators are holding a hearing on problems with TNReady. The two Democrats vying to be Tennessee's next governor made another pitch Tuesday to expand pre-K education. That's even though recent research from Vanderbilt University has led some communities, including Nashville, to hit pause on expansion plans. 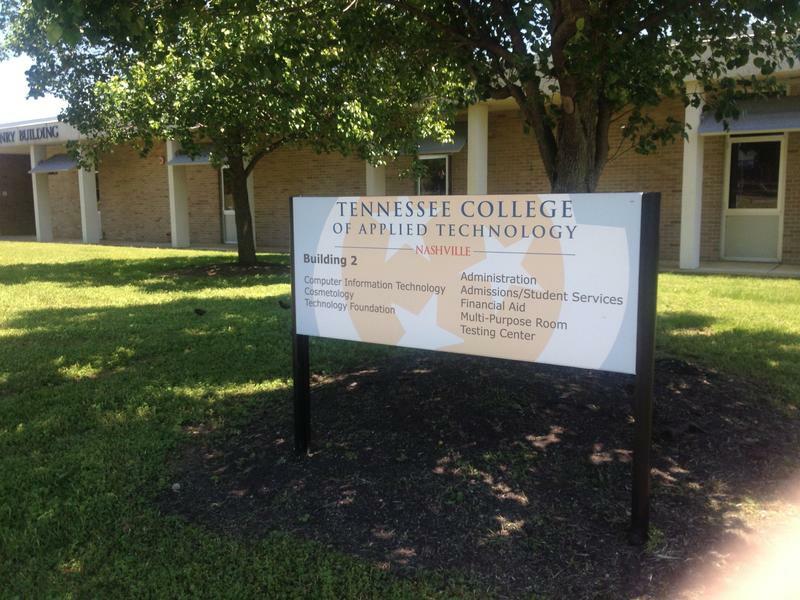 Technical colleges could get a big boost under Tennessee's next governor. Many of the top candidates are pledging to increase funding for the state's tech schools. They say putting more money into those institutions is the best way to close Tennessee's so-called skills gap. 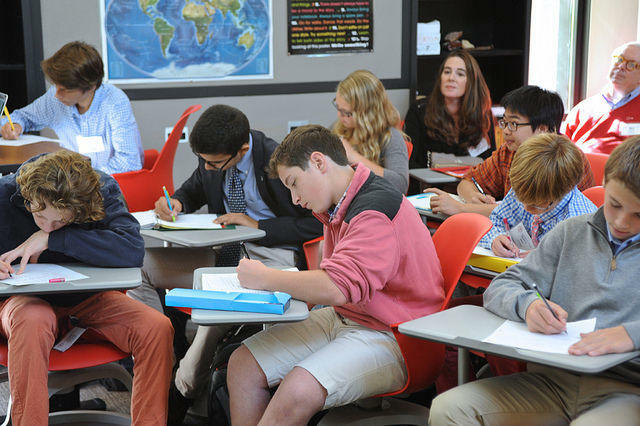 Never have so many Tennessee students taken Advanced Placement exams. And they're getting more college credit than ever before too.